Every year on June 5th, World Environment Day (WED) which is run by the United Nations Environment Program (UNEP) is celebrated to to raise awareness about environmental issues and inspire people across earth to adapt healthy lifestyles and safe practices to keep our planet healthy. WED is revered in over 100 nations, and it is also celebrated in Belize, the host country for the Caribbean Community Climate Change Centre (CCCCC). Protecting nature and earth, one of the focuses of WED is a priority that complements the work of the CCCCC. This weekend, Centre liaised with teachers and students and teachers from Belmopan Comprehensive High School, Belmopan Methodist High School and Belmopan Active Youths (BAY) for an excursion in honor of WED. On Saturday June 4th, 40 teachers and students went to the Toledo District to learn about agro-farming and the lifestyle of the people of Trio Village who truly live on the land. The students learned of the collaboration between the CCCCC, the Trio Farmers Cacao Growers Association and Ya’axché Conservation Trust. The CCCCC utilized $250,000 US from UK-DFID to sponsor over 28,0000 cacao seedlings to the farming association. The three groups collaborated and received a unique concession from the Forestry Department to receive a substantial concession to develop 926 acres within the Maya Mountain North Forest Reserve. On this visit the farmers showed them the additional 28,000 seedlings that were in the nursery which they would be planting as soon as they reach the right height. The students asked farmers like Isabel Rash how they watered the seedlings which was trek into the reserve. The questions also addressed drought and how the techniques utilized by agro-farming were different from the ones they used before. 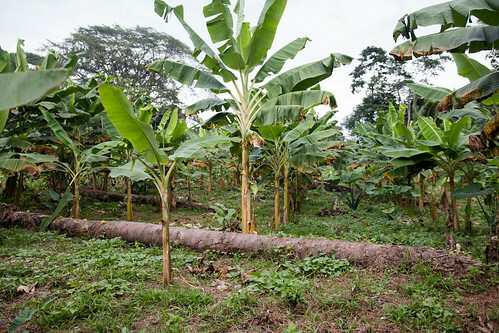 As they trekked deeper into the reserve, they found the crops such as beans and plantains that were also being grown by the farmers as a faster cash crop while the first set of cacao plants still needed more time to mature before the fruit would be ready for harvesting. One student commented that the soil seemed rich since there was no burning and also commented how it must had been harder for the crops to grow without using pesticides and chemicals to fertilize the soil.The Ya’axché officer on site, Julio Chub explained that the farmers used sawdust and decayed forest material to enrich the soil. He further stated that the conditions set by the Forest Department ensured that the soil and the forest would continue to be healthy. Isabel Rash, one of the leaders of the group explained that it continues to be hard work, but the benefit is there for their families and they will have an income to sustain them all year round, rather than with seasonal work in the banana industry which was his primary means of earning an income. There are at least 9 women in the Trio Farmers Cacao Growers Association and the students had an opportunity to meet 3 of them near the honey harvesting operation. Their trainer Isodoro Sho explained that not all the villagers had an opportunity to pursue education beyond primary school, and learning about bee keeping was one way they could earn money to put themselves back in the classroom or grow into a self-employed women. The students were particularly quiet when they met young women, their peers in age, being responsible citizens. The head of the Belmopan Active Youths, Anna Guy felt the experience was a good one and to have met some of the Trio villagers. After seeing the bee keepers in action, the students laughed and ran as the first bees flew out of the hives. But their running took them to the homes of the bee keepers who had fresh batches of honey on hand to sell. And while the transactions were ongoing, Mr. Sho informed the students that the association was developing a brand for the honey so that people would know whose honey they were buying and that the bees would also be used as part of the pollination process in the concession area. The final stop in the village was to the house of Victor Tut. Tut had just completed a ceremony for his son who graduated from high school and hoped to enroll in the National Resource Management Program at the University of Belize. With the bus parked outside the home, the students and teachers were welcome inside to a bowl of freshly cooked food and a smooth cup of cacao juice. The day that started at 6:30 a.m. in Belmopan and stretched into the Humming Bird and Southern Highways had suddenly turned into a hungry and heavy 5 p.m. inside Tut’s home. At dusk, boarding the bus, the students gave a hearty goodbye as they returned with new friends from the group interactions, photos and lessons learned about Trio Village for World Environment Day. The Ministry of Forestry, Fisheries and Sustainable Development (MFFSD) under the “Enhancing Belize’s Resilience to Adapt to the Effects of Climate Change” project which was funded by the European Union gave the initial support that started the Caribbean Community Climate Change Clubs. By caribbeanclimate in 5Cs in the News, News on June 6, 2016 .